The Hague is not the capital of the Netherlands. Yet, it is the city where Dutch government is housed. On top of that, it is a majestic city with magnificent buildings and lots of things to do. Obviously, the first thing you should do in The Hague is visit the Binnenhof. 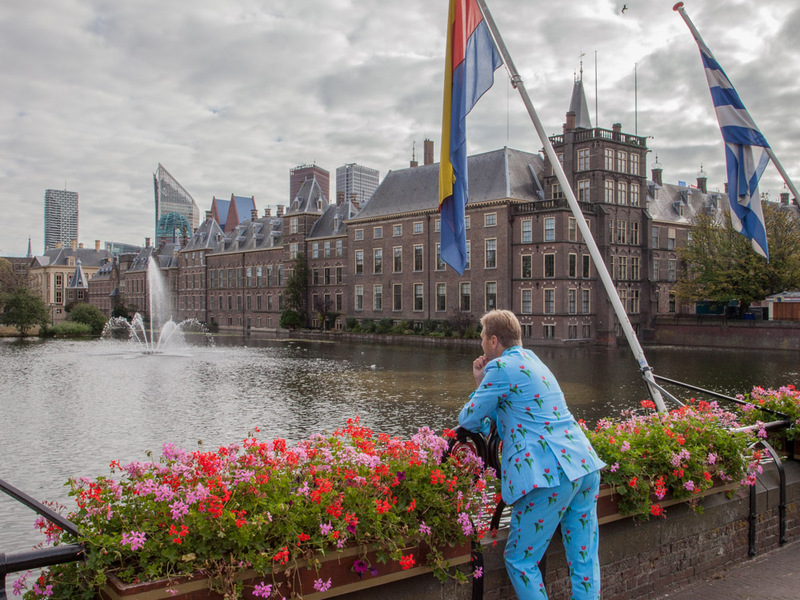 This is the historic center of Dutch politics. From there, you can wander around along majestic buildings, lots of statues, and through interesting shopping streets. Meanwhile, don't forget the interesting museums. Here you'll find the best works of painters Johannes Vermeer and Piet Mondriaan. And lots of others, too. When you're short in time, discover the whole of the Netherlands in miniature in Madurodam. And when you're tired, relax at the beach in Scheveningen. 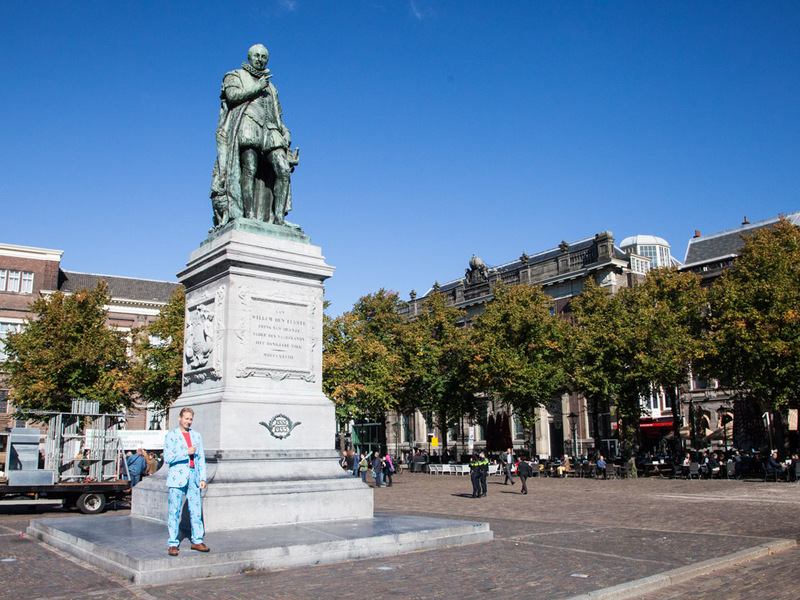 Below, we'll show you around The Hague, Netherlands. Or as we call the city, Den Haag. The Hague's biggest highlight is the Binnenhof. It is a collection of medieval buildings surrounding a courtyard. Hence the name Het Binnenhof, meaning The Inner Court. The central courtyard offers a beautiful view on the surrounding buildings. However the courtyard has also been used as an execution ground. One of the famous executions in history was of the Dutch statesman Johan van Oldenbarnevelt (1619). Het Binnenhof now functions as home to the Dutch Parliament. Part of it is housed in the 17th century North Wing and another part in a more modern building on the south east corner of the Inner Court. When you walk around the outside of the court, you will find the Hofvijver or Court Pond. Walk aside the pond in the little park for a beautiful view on the water and medieval buildings. On the north east side, you can see a small tower that the Dutch call 'het torentje', where the Prime minister of the Netherlands has his office. 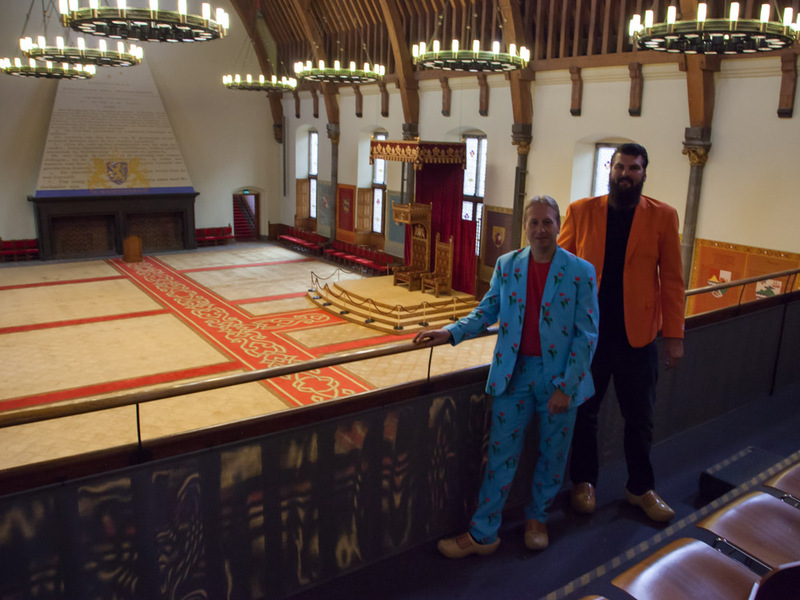 The highlight of the Inner Court is De Ridderzaal or The Hall of Knights. It is a spectacular 13th century gothic style building. The roof of the hall covers a surface of 18 by 38 meters (60 by 124 ft.). This is extraordinary large for a medieval building. The structure was made possible by the Dutch expertise of ship building. If you look at the roof, it resembles the frame of a large ship, turned upside down. The hall was originally a banqueting hall, but later served as a market place, a drill hall and a hospital. Nowadays it is used on special occasions and most noteworthy the yearly speech from the King at Prinsjesdag in September. This speech is called De Troonrede or The Speech From the Throne. The speech is written by members of the government and it sets out the main features of the government policy for the coming year. The speech can be compared to the State of the Union which is given in the United States of America. The Hall of Knights and some other parts of the Inner Court can only be visited with a guide. For more information see the website of the visitor centre, ProDemos. 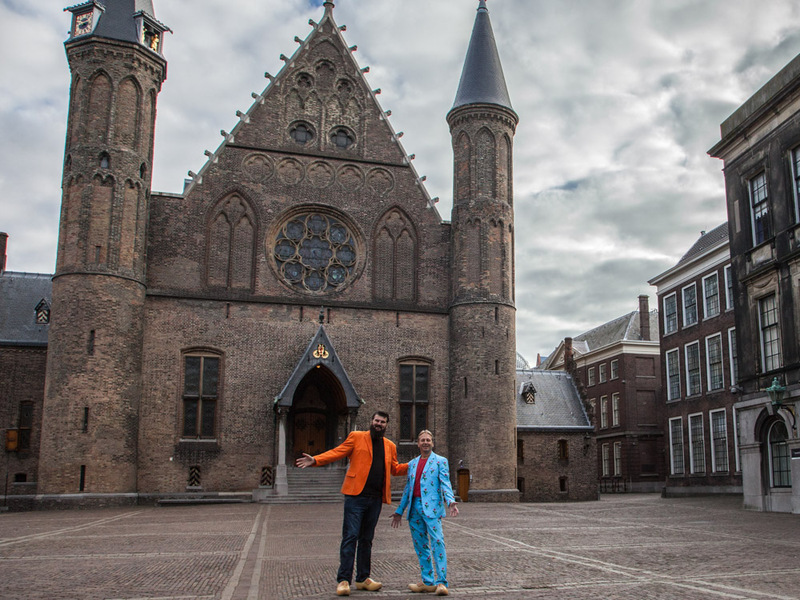 This magnificent 17th century building stands right next to the east gate of the Binnenhof. It was build in 1644, commissioned by Johan Maurits van Nassau-Siegen, grandnephew of Willian the Silent. Originally it was a city palace for Johan Maurits. But in the 19th century it became the Royal Cabinet of Paintings. The collection consists of many paintings by masters such as Rembrandt van Rijn, Johannes Vermeer, Pieter-Paul Rubens, Anthony van Dyck and Jacob van Ruisdael. One of the most famous paintings in the collection is Johannes Vermeer's Girl with a Pearl Earring. Nobody is sure who the girl is. The type of painting is called a tronie, a type of painting that has an exaggerated expression and elements of fantasy. This priceless painting was once bought by a Dutch Army officer for only 2 guilders, this is comparable to 20 euro's at current purchasing power. When the officer passed away, he donated it to the Mauritshuis in his will. Besides the Girl, you can see many other famous paintings such as a self portrait by Rembrandt and his famous Anatomy Lesson of Dr. Nicolaes Tulp. When you exit the Binnenhof from the west side, you will see a medieval building with a gate across the street. This is the Gevangenpoort or Prison Gate. This gate used to be the main entrance to the Binnenhof. It served as a prison for suspects that were waiting for their punishment. The most famous prisoner was Cornelis de Witt, a Dutch patriot who was accused of plotting to assassinate the Prince of Orange. He and his brother Johan were mutilated and executed outside the Gevangenpoort. Today the Gevangenenpoort functions as a museum. Here you can learn about crime and punishment through history. You can visit the medieval cells and see instruments of torture such as flogging benches, stretching poles and branding irons. The cell blocks can only be visited with a tour guide. See their website for more details. Behind the east side gate of the Binnenhof there is Het Plein, or The Square. This square used to be a kitchen garden for the Binnenhof. When it was separated from the Binnenhof, it turned into a city square. The most notable element of the square is the big statue in the middle. This is the statue of William the Silent. The statue used to be facing towards the Inner Court, but when it was renovated, the construction workers accidentally placed the statue back facing away from it. There are bars and restaurants at which you can sit outside to enjoy a drink or a meal. The square is always lively and usually cozy. Because of its location, it is also often used for political protests. The Hague is a great place for shopping. There are fashion stores with expensive and exclusive items, trendy design shops, and the popular big brand names. Popular locations to shop are Haagse Bluf, Spui and Denneweg. De Passage is an indoor shopping center close to the Binnenhof. It is the oldest shopping center in Holland. The architecture is amazing and definitely worth a visit. It is also a great moment to try some typical Dutch snacks. At the FEBO, you can find a wall filled with hot snacks such as kroket, frikandel and hamburgers. Throw in a euro or two, and open the little window in the wall to get your snack. Het Haagse Bos or The Hague Forest is only a fifteen minutes walk from the Binnenhof. Many of the people of The Hague go here for a picknick or a run. During medieval times, the forest shrunk to make place for houses of the people in The Hague. The government had to make rules to make sure that the forest would not be completely cut down. During the Eighty Years' War in 1571, one sixth of the forest was cut down to build defenses against the Spanish troops. William the Silent signed The Act of Redemption in 1576 that said that no one was allowed to cut down a tree in the forest and the forest was not allowed to be sold. The forest is a nice change of scenery if you want to escape the busy city for a while. Near the station Den Haag Hollands Spoor, stands a skyscraper. 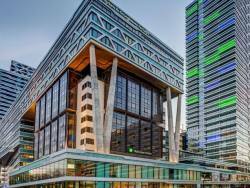 This building is called The Hague Tower. It is an office and residential building. 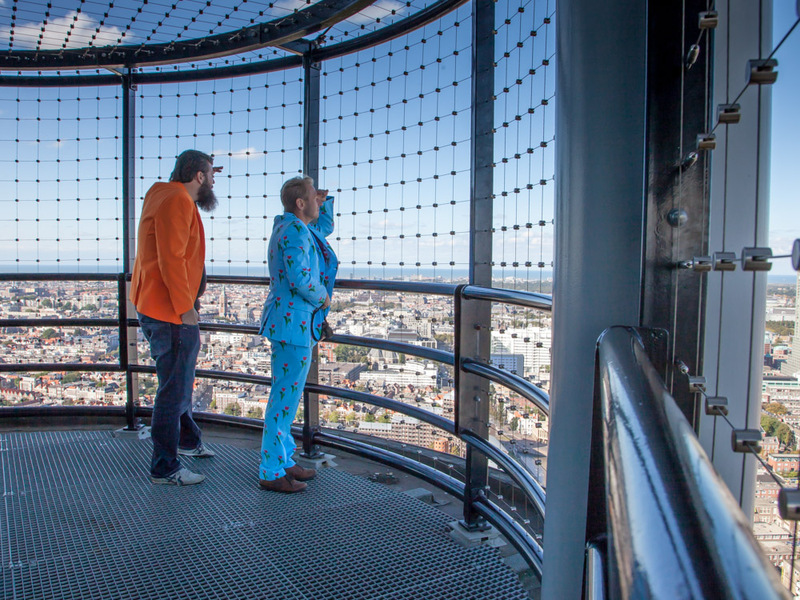 But at the top of the tower, there is a restaurant called The Penthouse. The restaurant is 135 meters high (442 ft) and the view is amazing. Normally, visiting the balcony comes at a small fee but when you have a lunch or dinner, visiting the balcony is free. Check out the website to make sure the restaurant is not booked for a private event. Also make sure to bring a warm sweater or coat when you go outside on the balcony because it can be very cold. The Gemeentemuseum or Municipal Museum is a splendid museum. The building itself looks fascinating and was built by the architect H.P. Berlage. The museum houses a big collection of different types of art and manages to present them in a fun and refreshing way. The Mondriaan collection is the biggest collection of Mondriaan art in the world. Piet Mondriaan was a Dutch artist (1872 - 1944) that was famous for his geometric artwork. His most famous artworks are the ones with horizontal and vertical lines and primary colors. The masterpiece of this collection is the Victory Boogy Woogy that was bought for 82 million guilders (€37 million euros) in 1997. Another collection is the Discover the Modern collection. It is a collection of modern art that contains pieces from Pablo Picasso, Claude Monet and Wassily Kandinsky. If you are looking for more Dutch heritage, make sure to visit the Delftware collection. It shows more than 235 items of Delft earthenware. It is displayed in an unique and fun way, combining the antique earthenware with modern art pieces. 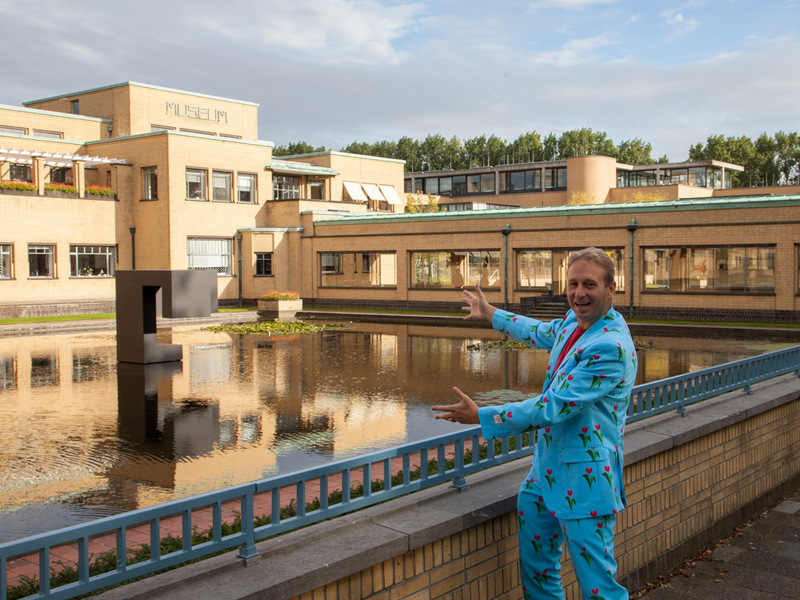 The Gemeentemuseum is a great museum to introduce children to art. The award winning Wonderkamers or Wonder Rooms are modern, interactive, exiting and fun! At the entrance to the Wonder Rooms, you get a tablet computer. You fill in the details and the tablet shows you to the direction of the first Wonder Room you can visit. In the different magnificently decorated Wonder Rooms, you get different assignments. 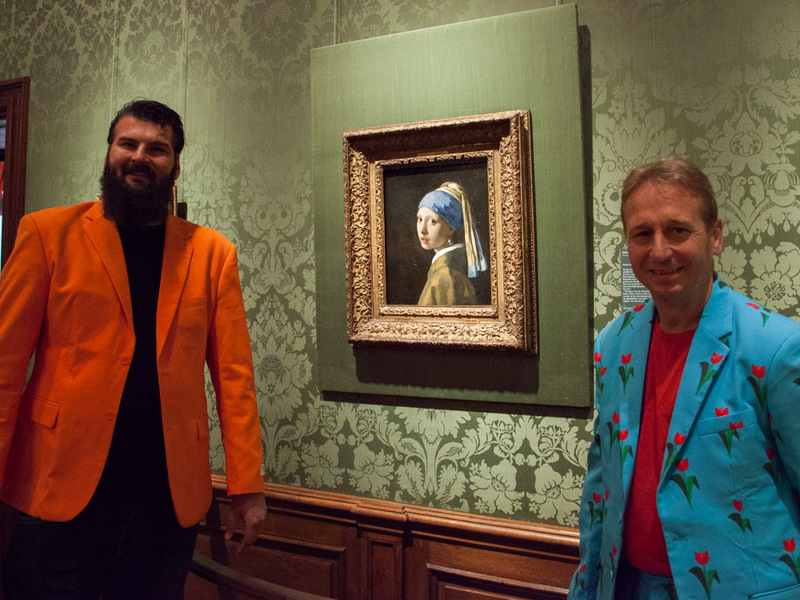 For example, you have to dance The Boogy Woogy together with Mondriaan to create a piece of art, or you have to walk the catwalk in fantastic historic fashion while being cheered on and photographed. Once you return home, the results of your visit will have been e-mailed to you. Here you can see the pictures that have been taken of you on the catwalk and the results of your own museum exhibition from the objects that you have collected. Not enough time to visit everything in the Netherlands? Don't worry, just go to Madurodam! Madurodam is a miniature park in The Hague. It has scale models of famous Dutch landmarks. Walk among the incredibly detailed scale models, push a button and see how they come alive. There are many scale models of landmarks such as The Dam square, The Dom church tower from Utrecht, and the city hall of Gouda. Read more about it on our page about Madurodam miniature town. The Hague is the only city in the Netherlands with a beach resort: Scheveningen. Scheveningen is a stylish beach resort. There is lots to see and do, and not only in summer. The most unique feature of the beach is the big pier. The indoor area of the pier is free to access. It has small shops and excellent pop up restaurants. At the end of the pier you can enjoy the view and even enter the big Ferris Wheel. Read more about Scheveningen the Hague, the grand lady of Dutch beaches. This affordable hotel in the center of the city is only a 10 minute walk to Het Binnenhof and Het Mauritshuis. 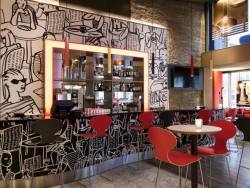 The bar has a young and modern vibe and the daily breakfast includes fresh coffee, scrambled eggs, sausages and bacon. This hotel is right next to The Hague central station and is a perfect beginning for your Dutch adventure. The hotel is next to the Haagse Bos, the small forest in the city center. Het Binnenhof is within a 15 minute walking distance. 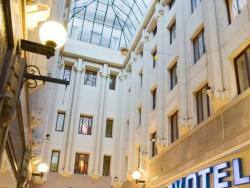 A beautiful location in the Passage, the oldest indoor shopping mall of Holland. It is located right across Het Binnenhof and Het Mauritshuis. The hotel is a little more expensive but has the best location of all the hotels in the city. Up to 2 children (15 years and under) stay for free when sharing a room with their parents.